Having an accent wall is popular in home decorating, but many decorators are very selective or down right negative about the idea. I wrote at length about accent walls in another post and listed 5 reasons to consider an accent wall. Accent walls either work well or are dismal failures. Make sure yours is in the successful category. Recently a reader requested that I write a post about using wallpaper to create a focus wall. Ask and you shall receive. Here are my thoughts on the topic. Any recessed area works well as an accent wall because it allows you to use the architectural features of the room to good advantage. This bedroom shows how well a recessed feature can be highlighted . In addition, the paint colour totally supports the wallpaper design. This is one of the biggest areas where you can mess up. 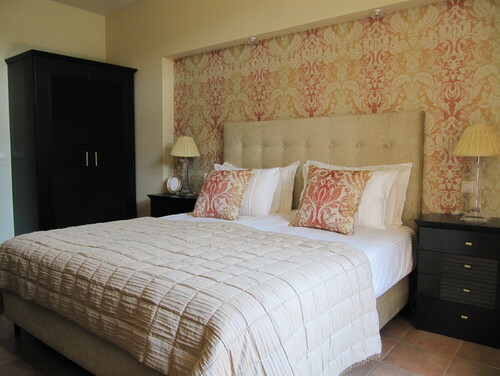 This is another bedroom where the pattern beautifully accentuates everything else in the room. The colour scheme is quiet and the wall colour blends well with the tones in the paper. 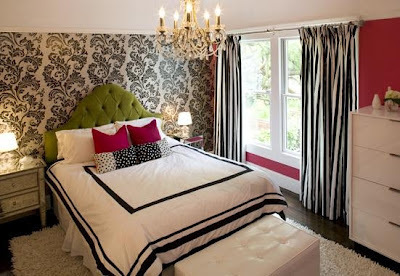 This room has a completely different vibe with its pinkish red walls and white and black accent pattern. It isn't a look I personally like because there is just too much colour for me. That doesn't make the design wrong. With the white furniture you really need colour on the walls. The wall behind a bed is the most advantageous wall to accent The furniture placement makes it the focal point in the room and you are merely enhancing it with your wallpaper choice. Consider the effect that large mirrors have on this design. The mirrored doors create two accent walls and the impact effect is diminished and for some people it would be visually confusing..
How do you feel about the accent wall in this room? Do you think the designer choose the best wall to highlight? Does the wall colour work well with the colour scheme in the wallpaper? My answer would be negative on all counts. To be fair, one could argue the use of pattern on the opposite wall as a way to distribute visual weight in the room. There's always more than one way to look at design. Light coloured furniture always looks great with a pattern behind it. When you add pattern that is this dark and strong remember to consider how it will look with what is happening in the next room. Don't be afraid of large scale pattern on one wall. There is lots of pattern in this room, but it works because the designer stuck to a tight colour scheme. When you choose bold patterns remember how much harder you have to work to find art that will hold its own on the pattern. The two small pieces above are lost in the pattern. Something bolder and larger would have been a better choice. Sometimes the devil is in the smallest details. When you look at this design what is the first thing you notice? For me it's the sofa and not the patterned end wall. Perhaps this is what the designer wanted to achieve and that might account for the downplay of art on the wallpaper. Again, more than one way to look at things. 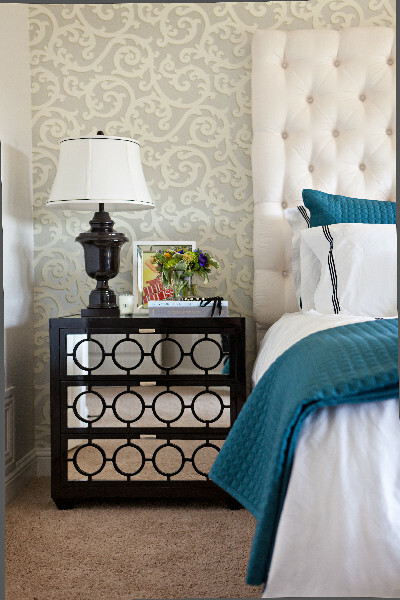 Look for opportunities to wallpaper where you have stand alone walls that will work well as an accent. Often temporary walls or stand alone walls are used as dividers in condos or basement apartments. It is a way to divide space without closing it off. Think about all the ways you could use wallpaper as art . Use trim to emphasize a design and fill in with wallpaper. The sky's the limit for this. I particularly like the grid created for the dining room wall with two colours of wallpaper. The colour tones work very well together. Fireplace walls that extend beyond the main wall offer a perfect place to add pattern. You can be very bold because there isn't much pattern used. Would you use these accents on the mantle or different ones? Do they stand out or are the lost? Does the arrangement need some height. Displaying objects against a bold pattern takes some thought . There's lots of choice in things to move around in this room. 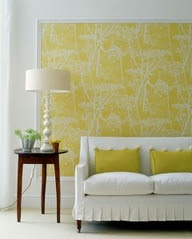 Check out lots of other images on this great post about wallpaper accents. Define a space with just a strip or two of wallpaper as a backdrop. And there you have it. There are all kinds of ways to brighten your home with wallpaper accents. This only scratches the surface. You might want to refer to this other post I wrote on the topic last year. I also have a growing collection of ideas for your walls on Pinterest. 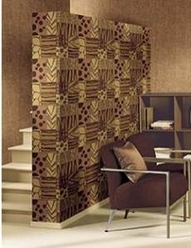 Wallpaper can be used in any room of your home. In fact, in a well-designed home decor, you will use a variety of different wall treatments. Loved this post! I'm familiar with Bonnie's site and agree that she finds the most beautiful things and has the most reasonable prices. I sure would love to win that cute pitcher. Fun giveaway! I'm going now to leave comments on your and her FB pages.